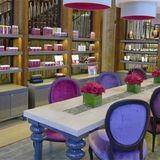 The award-winning SoSPA is situated within the luxurious Sofitel London St James hotel and offers a wide range of relaxing treatments. What did you think of SoSPA? I had such an amazing time at the spa, afternoon tea afterwards was great and the cocktails in the st james bar - WOW! The massage was so relaxing, it just seemed to go so quickly! Can't wait to come back - 10/10!